Taking control of important business and contact conversations is made easy with TalkNotes Plus. This video highlights contact information and previous conversation notes which appear before call pickup and are available during the conversation. You can easily attach notes to the call log after a call; plus add reminders that appear on your calendar. With the latest release, 1.8.0 TalkNotes Plus, our development team has integrated the Samsung Galaxy Note S Pen. The S Pen provides faster and more accurate input than conventional stylus pens. It is an input tool that provides a similar feel to an actual pen by detecting the pressure applied on the screen with great accuracy. For Galaxy Note Users, who struggle with the keyboard; here is a more natural input method. What separates TalkNotes Plus from all the other mobile notes apps? 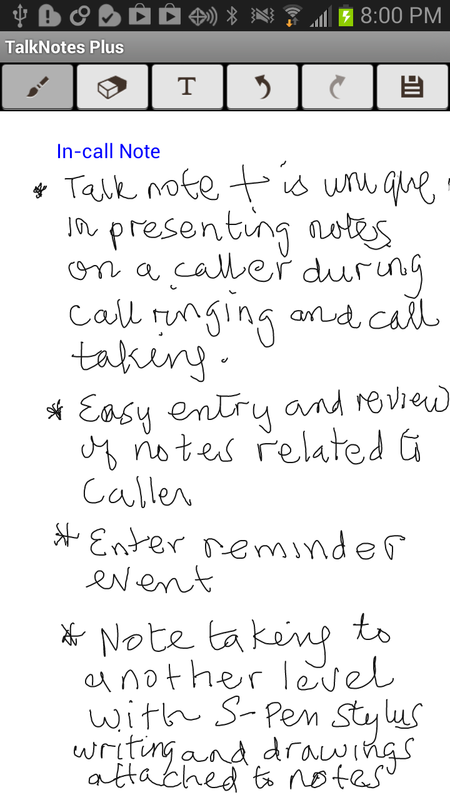 Samsung Galaxy Note users, whether keyboard or S Pen, capture your notes with TalkNotes Plus. 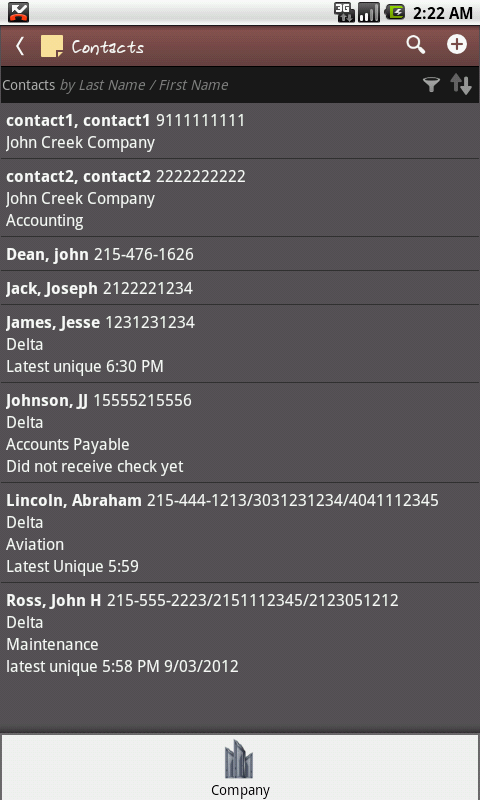 Most of our customers use TalkNotes Plus for business and need to assign company names to their contacts. Here are the steps. A text box will appear “Given Name”. There is also a subcategory under Company called Matter for additional identification of a Contact. Real Estate agents require keeping precise information about sellers and their homes for sales, as well as buyers and the type of homes they require. This often leads to a series of phone communications on new offerings, selection processes, as well as the to do list – finance, inspection, closing and moving in. 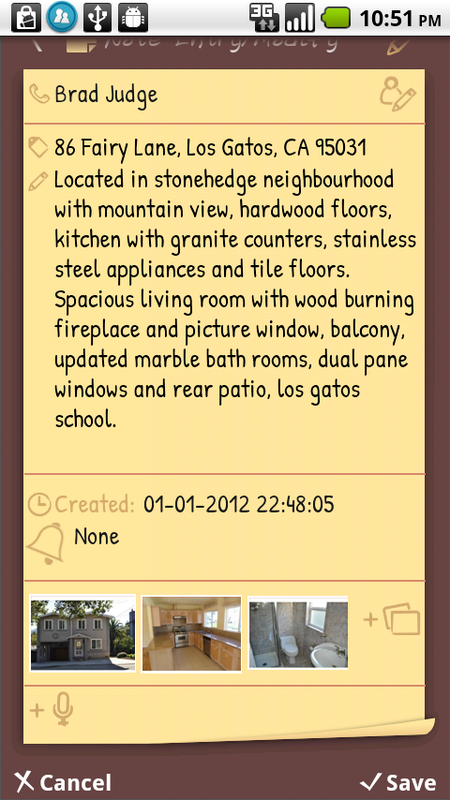 What TalkNotes Plus provides is a means of creating and saving vital information on buyers and sellers in contact lists and notes on homes for sales or desired, which are promptly accessible while preparing for a call, on call ringing or during a call. Effective recruitment requires keeping precise information about companies and their job offerings, matching qualified candidates and often essential phone communication between the parties in the recruitment and placement process. Tracking sales prospects is essential for maximizing the ability to turn prospective clients into customers. Sales’ canvassing is a multiple-step process with certain customers; involving a constant thread of discussion. There is also the need to schedule appointments, present product news or announcements, as well as reaching out, or touching base from time to time. This process could involve a large number of contacts which need to be organized to maximize your sales effort on the phone.